The “Be Floridian” program was born over a decade ago of the Tampa Bay area. 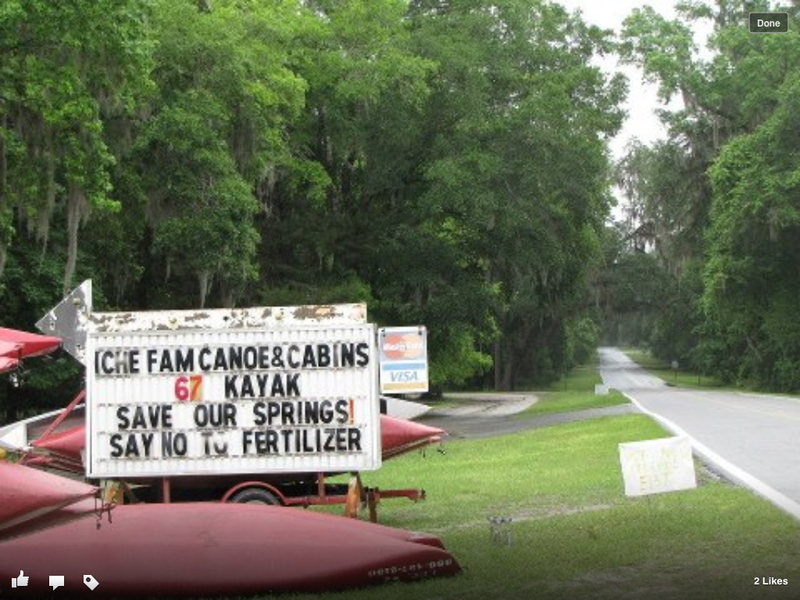 This program has many elements, but most noteworthy is that “strict” fertilizer ordinances evolved collaboratively along the counties and cities of Florida’s “southerly” east coast. 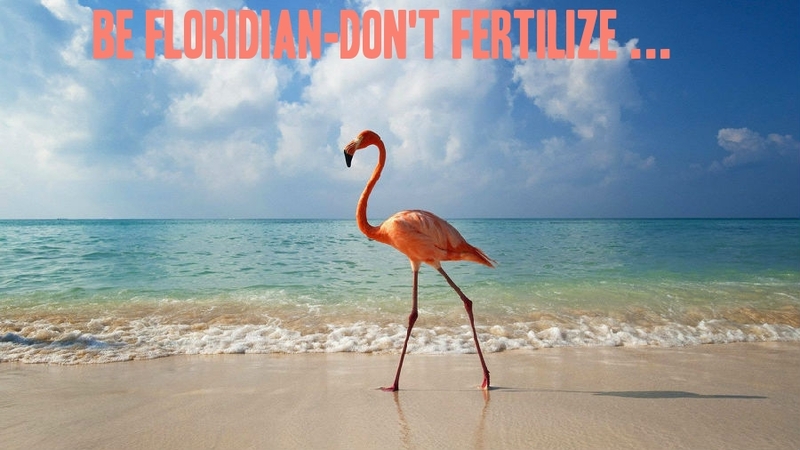 In case you don’t know, there are variations, but basically a “strong fertilizer ordinance” is one that does not allow fertilization with phosphorus and nitrogen during the summer rainy/hurricane season. I beg to differ, and here is why. Of course they are working. A four-year old can tell you they are working. Ad in Stuart News. 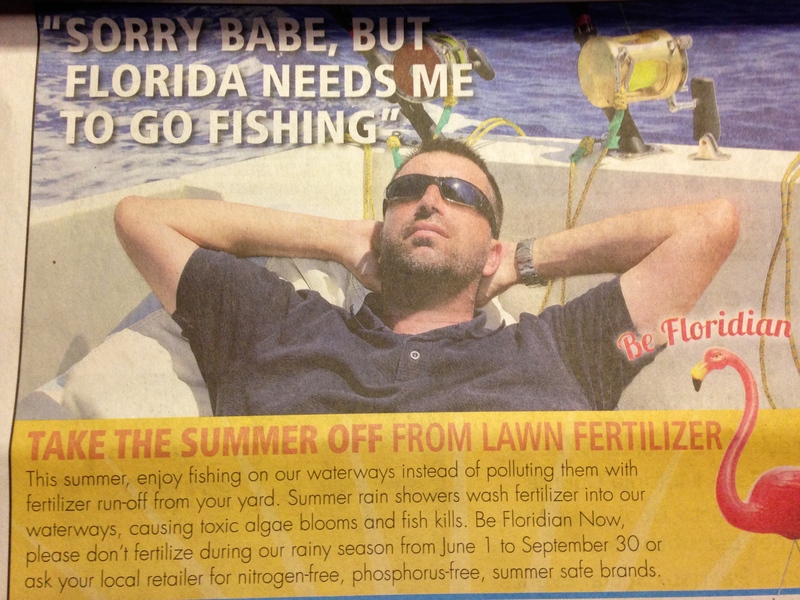 Martin County has a strong fertilizer ordinance and is now promoting the BE FLORIDIAN program here in Martin County. Dianne Hughes and Deb Drum deserve applause for these great ads, 2015. I use this analogy a lot when discussing Lake Okeechobee and the Everglades Agricultural Area’s 700,000 acres south of the lake blocking the natural flow of water from the northern estuaries to the Everglades. In spite of the sugar and vegetable empires south of the lake trying to convince us that it is water from Orland and the Kissimmee River killing our St Lucie River/Indian River Lagoon, any four-year old studying the River Kidz program will point to the area directly south of the lake as biggest problem forcing the water up and out the estuaries rather than allowing it to flow south as nature intended…We need a third outlet south of the lake. There is too much water to hold it all north. End of story. I don’t need a study to tell me this. I know it. A four-year old knows it. You know it. Back to fertilizer….last night it rained hard here in Sewall’s Point. My rain gauge says two inches. Seemed like more than that. If my yard had been fertilized of course that fertilizer would have gone into the gutter and down the drain and into the Indian River Lagoon. You can go out and watch this from my driveway. 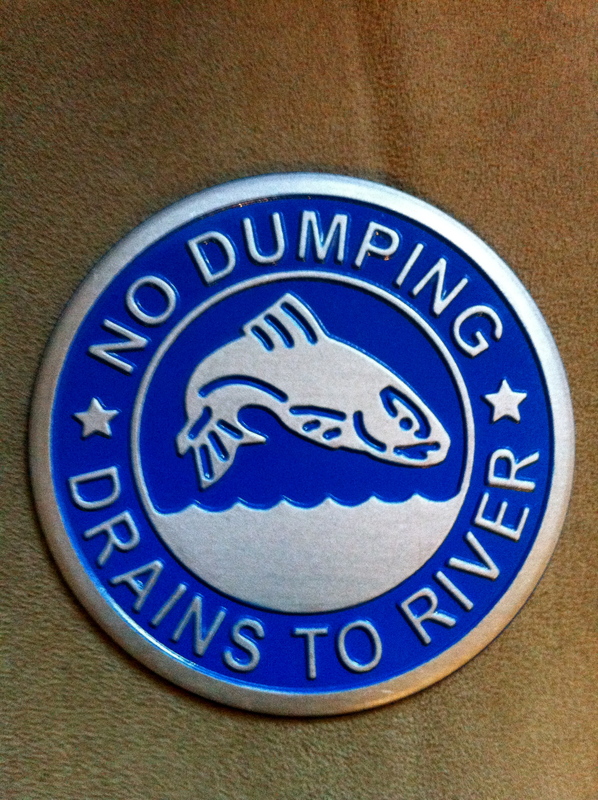 It must be noted that until the ACOE and SFWMD (collaborating at the direction of our government) stop dumping from the lake and out over expanded canals, we will never know our “area’s” levels of phosphorus and nitrogen. For example, the ACOE began releasing into our SLR/IRL this January and just stopped a few weeks ago, so if a scientist had done her or her study recently, they would be measuring nutrients that came into our river from “other places” too. But we, here, are doing our part and can feel good about this…keeping our house in order will help push order in the houses of the state and federal governments that are presently quite un-orderly. As a sidebar before I close, I recently had the pleasure of meeting Mr Woody Woodraska who headed the SFWMD in the 1980s before it was under the anvil of the governor and the state legislature. The topic of visiting Cuba arose. My husband Ed and I will be visiting Cuba this fall with our church, St Mary’s. In the course of telling his story visiting as a competitor in the Ernest Hemingway competition, he alluded to Cuba’s long repressed economy and how this kept fertilizers, via the agriculture industry, from ruining Cuba’s waters, fish and wildlife. Thus overall, Cuba’s waters are healthy and beautiful today. Yeah…rolling right over our fish, and our wildlife, and over ourselves as we see our own economy suffering from dirty waters. Whew. I need a cup of coffee. 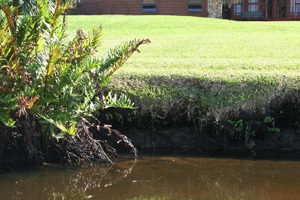 Grass going right over edge of canal….photo DEP. 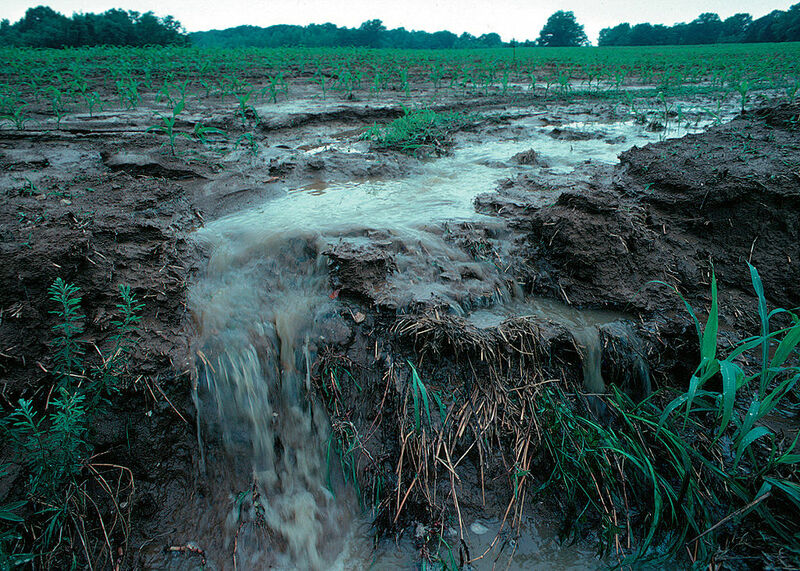 Ag runoff from fields into canals DEP photo. An ad from the west coast of Florida, 2014. Ad west coast near springs. 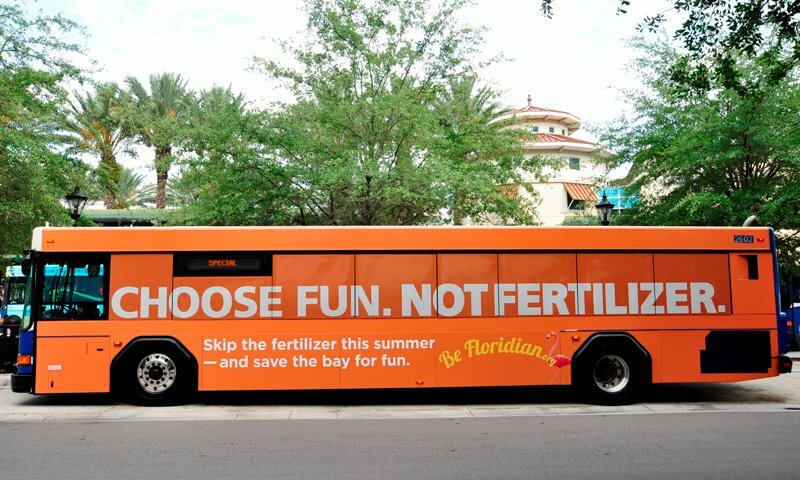 Ad on bus west coast or Gainesville. RK artwork 2011. 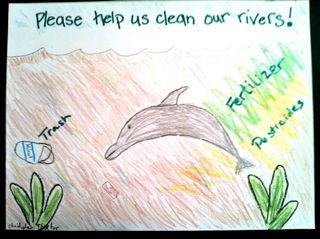 Save the dolphins. 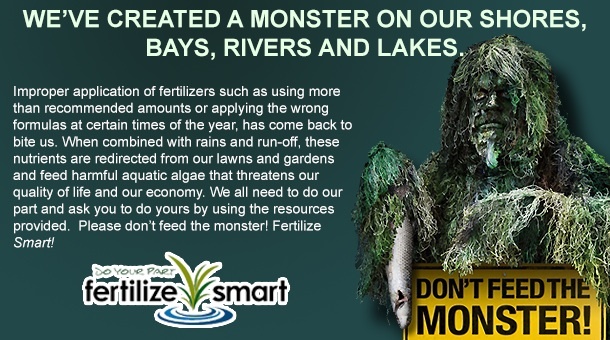 Fertilizer is not good for their skin, or seagrasses needed by the fish they eat. The National Research Council’s book “Clean Coastal Waters, Understanding and Reducing the Effects of Nutrient Pollution,” National Academy’s Press, 2000, is the best book I have read on this subject. It can be ordered on line. 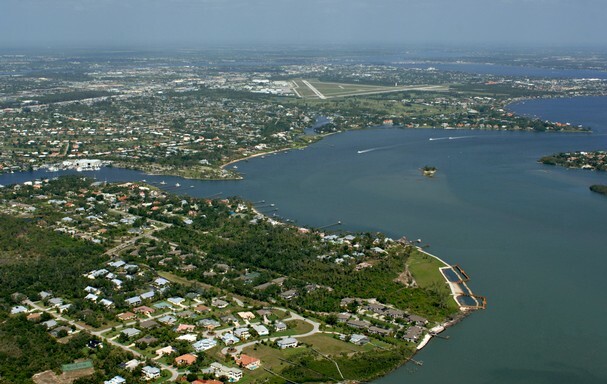 Recently, Harbor Branch Oceanographic Institute, located in St Lucie County, (http://www.fau.edu/hboi/) released their “Our Global Estuary,” U.S. National Workshop, Draft Report. Dr Megan Davis, Interim Director of Harbor Branch, co-chairing with Dr Antonio Baptista and Dr Margaret Leinen, along with other local and world scientists are leading this project. 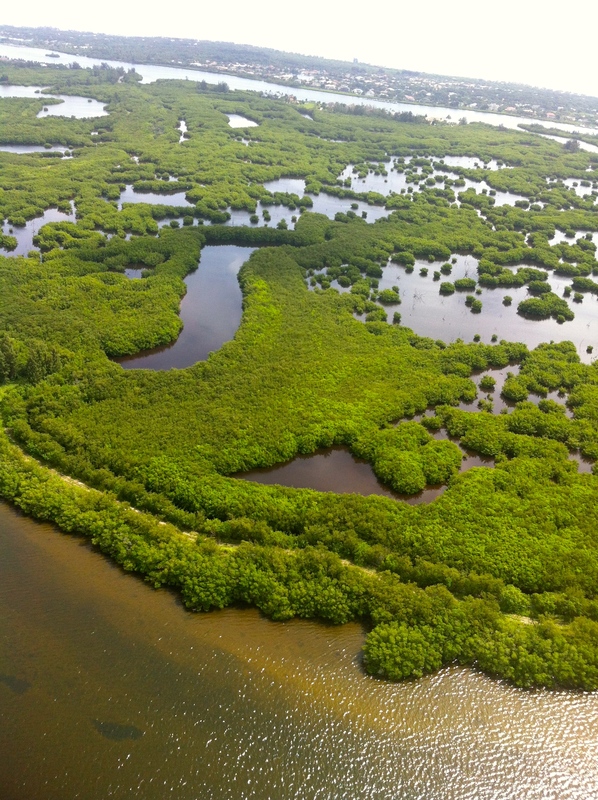 As one reads on, the report discusses that population growth and land-use choices not only near the estuaries but also many miles upstream can have a significant effects on estuaries. It is noted that “as farm production methods have evolved to increase yields, more nutrients have made their way to the water causing algae overgrowth to the point of suppressing seagrass. 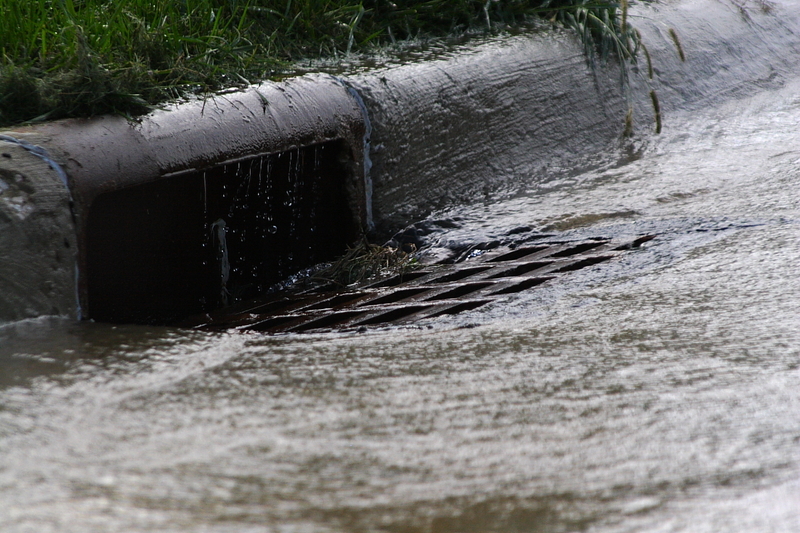 These pressures can cause disease and death in fish, marine mammals, birds, and other animals.” Land development also impacts estuaries with its runoff and diversion or redirection of water. The largest estuaries in the world are listed in the report are not in the United States. 1. Ganges, Indian, Bangladesh, Nepal; 2 .Yangtze (Chang Jiang), China; 3. Indus, Indian, China, Pakistan; 4. Nile, Northeastern Africa; 5. Huang He (Yellow River), China; 6. Huai He, China; 7. Niger, West Africa; 8. Hai, China; 9. Krishna, Indian; and 10. Danube, Central and Eastern Europe. Once again, like the Dr Seuss children’s book, Horton Hears a Who, where the residents of Whoville together shout WE’RE HERE, WE’RE HERE, finally to be heard, the Treasure Coast is noted for its efforts, this time in a document that will be shared around the world! Thank you to Harbor Branch for its continued leadership and efforts in ocean and estuary research and thank you to the people of the Treasure Coast or “Whoville” who have been heard and continue to help save the Indian River Lagoon. 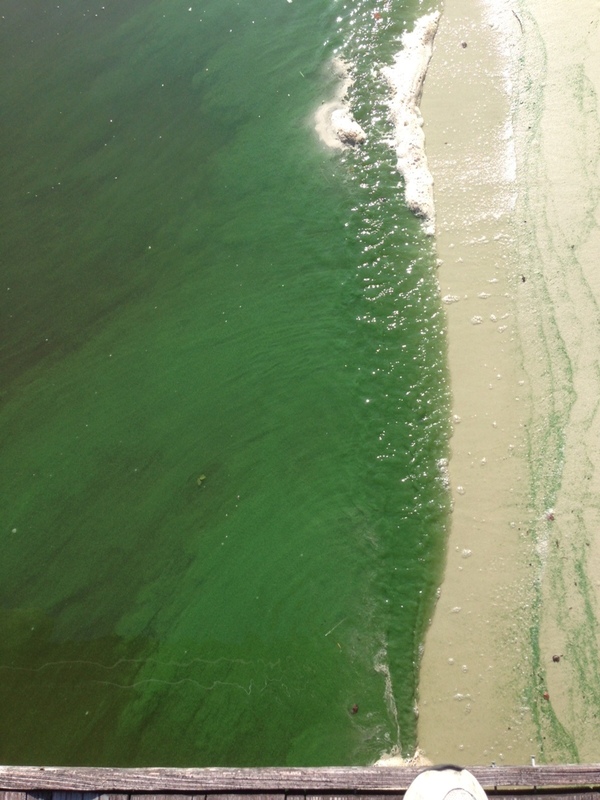 As much as I am thankful for the politicians and policy makers who have recently gotten monies allotted to fight the “toxic algae in Florida’s waterways,” I am slightly miffed. From what I understand, and have learned over the past years, much of the research to understand these problems has already been accomplished, particularly by the National Research Council. 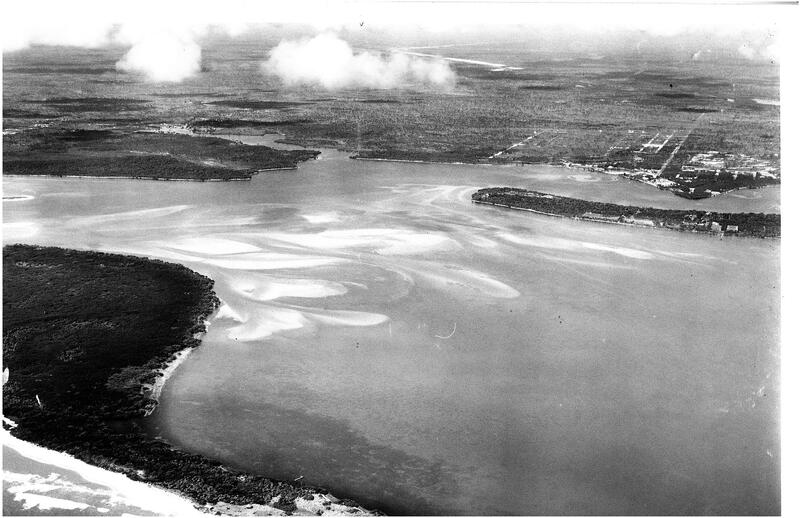 In 2008, when I was just beginning to really plow in and try to understand why the St Lucie River and Indian River Lagoon issues were happening and basically at the time being ignored publicly and politically, I was recommended to read “Clean Coastal Water, Understanding and Reducing the Effects of Nutrient Pollution,” published by the National Research Council in 2000. The National Academy of Sciences is part of the National Academies, which also includes:the National Academy of Engineering (NAE); the Institute of Medicine (IOM); and the National Research Council (NRC). Locally, Dr Brian LaPoint working in St Lucie County, helped with the publication. He is from Harbor Branch/FAU. Also Dr Margaret Leinen, the Executive Director of Harbor Branch at the time, now of Scripps Oceanography in California, was invited to speak before Congress on the subject. 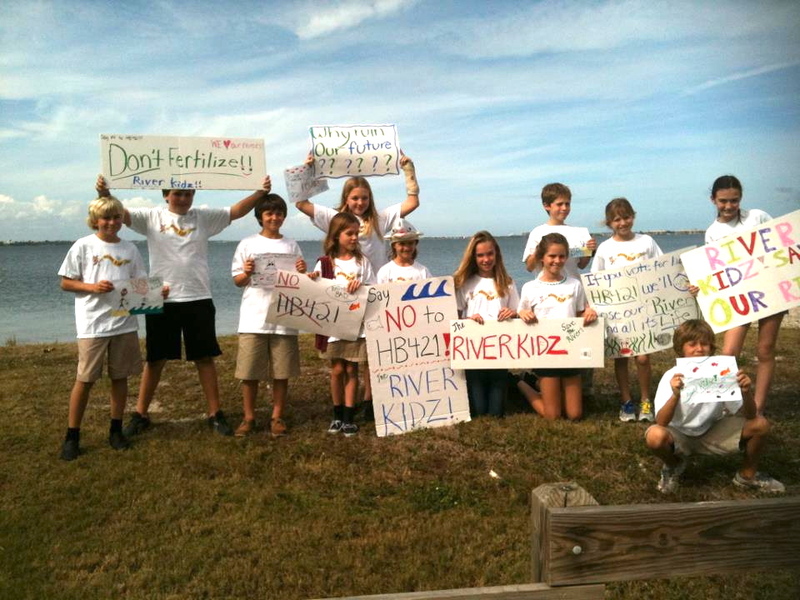 For me as a Sewall’s Point commissioner, our commission fought and passed a strong fertilizer ordinance in 2010, and since that time many others have as well along the Indian River Lagoon. This is just a start and local governments will have to do more in the future. NAS states nutrient pollution problems come from “agricultural land, animal feeding operations, and urban areas plus discharge from water water treatment plants and atmospheric deposition of compound releases during fossil fuel combustion all add nutrients to fresh water before it reaches the sea.” We along the coast in cities, etc..qualify as the “urban areas.” And locally that is all we have the jurisdiction to control. The rest, particularly agriculture issues of “best management practices” and more, has to come from the state and federal governments. 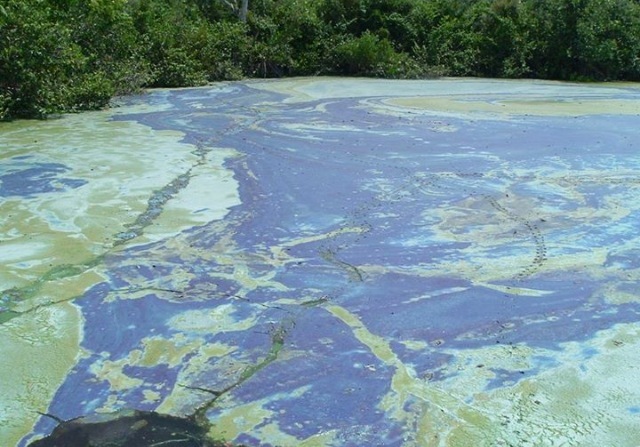 So back to Senator Bill Nelson, who I admire very much, and who grew up in the Melbourne area along the IRL, spearheaded a recent bill by the US Senate that will “fund research into the causes and control of large algae blooms.” This is terrific, but guess what? “We” basically already know the causes. Lets continue dealing, moving and helping dairies and animal operations close to waterbodies; let’s implement even stricter laws on water treatment plants like the one along the Banana River in the Coca Beach area, in the northern central lagoon, where all the Unusual Mortality Events (UME) occurred last year of manatee, dolphin, and pelican deaths, and the majority of the 60% seagrass loss in the IRL since 2009 has occurred. “Invasion of government,” you may say. “Yes it is.” And I don’t like it either, but at this point in order to to save the SLR/IRL, is their any other way? If we need the local data, then lets get it, but I do believe we already know where to start and I do believe we already know what to do.